The MoGo Wireless Mouse is a business-card sized, Bluetooth-enabled mouse that stores and recharges neatly inside (yes, inside…) your laptop’s PC card slot. 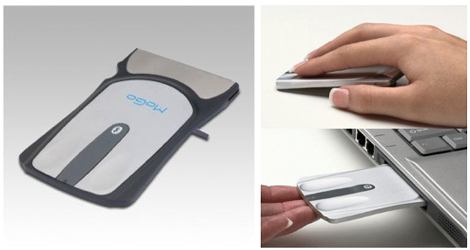 To recharge your MoGo Mouse, just slide it into the empty PC card slot in your laptop. It will fully recharge in less than an hour and provide you with enough power for about 8 or 9 hours of use. As you can imagine, the MoGo Mouse is specifically designed for people who spend a lot of time traveling like writers, reporters and sales reps. Other mice, even those meant for travelers, usually don’t cut it. Mini-mice (aka “walnut shells”) get lost in your hand and are difficult to maneuver, and the idea of carrying a full-sized mouse defeats the entire purpose of mobility on the go. The MoGo Mouse is a natural fit for road warriors. Storing it inside you PC Card (PCMCIA) slot is pure genius and the fact that it charges there is just the icing on the cake. The only thing I’d like to see in future models is a scroll wheel. I know that the size of it makes it hard to have a wheel but maybe a touch wheel, like one some laptops, could have been possible. If you spend a lot of time on the road with your laptop, then the MoGo Wireless Mouse will just make your life easier.